Because your need for the seller's attention may not end with the sale. Most of the time, an eBay purchase is a fairly self-contained thing—you either place a bid or Buy It Now, then pay with PayPal, and—after a brief wait, your item is delivered. If you're a frequent, heavy eBay shopper, you likely know how to do all of these things, but if you're less familiar with eBay purchases, these tasks can seem a bit daunting. Here's how to do them. If you're on a mobile device using eBay's mobile app, tap on the "My eBay" control (you may have to hunt for it a bit, but it's there). In your My eBay purchases list, you'll see tracking information for every purchase you've recently made—along with an estimated delivery date—just under each listing title. 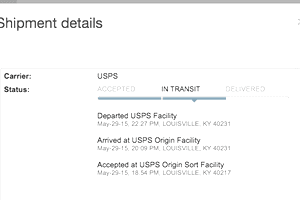 In most cases, you can track your package simply by clicking on the tracking number shown. If no tracking information is show, either your seller hasn't shipped the item yet, or (equally likely) they have shipped the item outside of eBay's label printing system and haven't manually entered its tracking number. You'll need to follow up with them to get shipment and tracking details. You'll be asked to select a reason for your inquiry. For general questions, select the first item, "I have a question about using my item or I want to send the seller a message." Then, click "Continue" to be shown a space to enter your message. Enter your message, then click "Send" to send it to the seller, who can then reply to you. On the following page, you'll be asked to select a reason for your return, and given a space to add details about the reason for your return, as well as a photo. If possible, enter a sentence or two detailing your particular issue with the item and your desired resolution ("I want a refund!" or "I'd like to exchange this item," for example), and supply a photo of the item's issue, if the issue is visible. These steps will help you to make the case that a return is justified in the case that the seller balks or drags his or her feet. Once you've entered the relevant information, click "Request a return" to notify eBay and the seller that a return is desired. You'll receive instructions for completing the return by email. Note that this step isn't to be taken lightly; when shoppers request a return, their eBay defect rate increases—and this can affect their ability to sell on eBay in the future. On a happier note, sometimes you just want to buy more of what the seller has to offer, but don't want to go through eBay's main search tool (which can return thousands of results) to track the same seller down again. After doing this, you'll see everything else that the same seller is currently selling, and be able to easily buy from them again.